Freshwater fishing for catfish? Simple? Some fishermen I speak with claim that catfish are relatively too easy, or just not challenging enough. A few of those anglers almost refuse to actually dedicate themselves to fish for these whiskerfish. Apparently, those skeptical fishermen don't know what they're really missing! In my opinion, fishing for catfish is quite awesome. Catfish, like any other species of fish, are challenging and fun fighting. They may be biting extremely good one day but, seemingly disappear on your next fishing outing. That's the beauty of fishing. That's what keeps many people coming back for more... the challenge and the rush. Catfishing can be as simple as pulling up on a spot, casting in some stink bait, and patiently waiting until a monster catfish smashes it. That's always a nice way to enjoy a relaxing day as you're chatting it up with a fishing buddy. How many catfish do you usually catch like that? What is your biggest catfish ever caught while sitting around and waiting...? 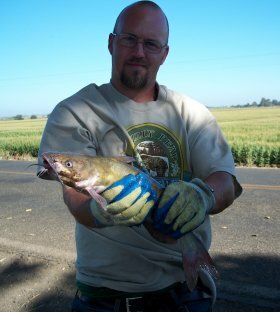 There are proven catfishing methods and fishing techniques to learn how to catch catfish on a more consistent basis. Understanding key locations of which catfish tend to inhibit, when to fish for them, and with knowing which baits to use, shall indeed, allow you to catch more of the biggest catfish than your fishing buddies. What kind of baits do you use when fishing for catfish? Some catfish anglers like to create their own homemade catfish bait recipes of sweet smelling concoctions of stink baits. While many other catfishermen would just rather hit up the bait shop to get their choice for the best bait for catfish. Catfish will generally devour anything that resembles food. Simple store bought baits such as chicken liver will often generate plenty of catfish, but most often the smaller sized fish. Giant catfish are generally caught using bigger and more realistic looking presentation baits. Most of the larger sized catfish I've caught were enticed from using bait fish like fresh shad, anchovies and sardines. I've even caught quite a few of the whiskerfish on accident as I was fishing for other species of fish like stripers and black bass. And there have been incidents when I've discovered prime honey holes with the catfish piled up. As you can imagine, non stop action. On the other side of the spectrum, I've caught stripers while intentionally fishing for catfish. Have you heard of anglers catching catfish with lures? It happens more often than we know. Sometime it's intentional, while most often it's just sheer luck. I managed to haul in this hefty channel catfish out of a stocked lake near my hometown. Check out some cool fun facts about whiskerfish hitting artificial baits. 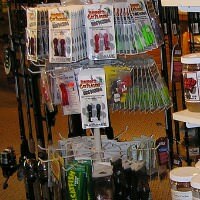 Also find out about some of our personal favorite lures and where to get your own from our online resources. 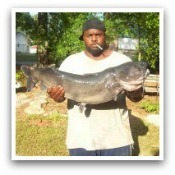 Ever thought about catfish noodling for those giant whiskerfish? Yeah, that's right! Fishing with your bare hands... You are the bait! 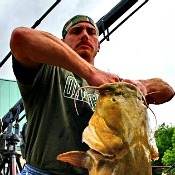 Submit your guide services for catfish noodling trips to our handfishing directory for free. There's an overwhelming amount of catfish species in the world. They can be found roaming in all types of waters throughout, which includes ponds, rivers, streams and lakes, except in the continent of Antarctica. 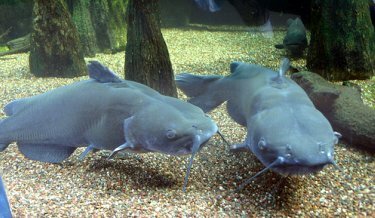 The three most commonly sought after catfish species are blue catfish, flathead catfish, and channel catfish. I, myself, usually target channel catfish. Although they generally don't get as big as the other types of catfish, they are a blast!